I saw The Little Mermaid for the first time this week. I shunned Disney animations when I was a child, so I’m just catching up with things like this now. I was expecting another cute and inoffensive cartoon, so I was unprepared for how dark the whole thing would get. We need to have a conversation about this, because it’s just weird. Let’s start with the titular mermaid herself, Ariel, daughter of the sea king Triton. Ariel wants to travel to the surface and mingle with humans, who are feared by all those who live under the sea. She isn’t the first royal progeny to yearn for a life away from the stifling confines and responsibilities of the royal court (see The Lion King‘s Simba and Frozen‘s Elsa), and a longing for a different life is pretty much common to all Disney heroes (Aladdin, Belle, Mulan, Quasimodo, Nemo, etc.). So far, so business-as-usual. For Ariel, a life on the surface and falling in love with a human man become an obsession. Ariel makes poor choices in pursuit of that obsession. This, too, isn’t so extraordinary at first glance. Simba and Elsa both cause chaos in their kingdoms when they dessert their duties to go after what they want. But Ariel’s mistake is unusually conscious and deliberate. She makes pact with the octopoid witch Ursula, sealed by a signed contract, exchanging her voice for a chance to be human and fall in love, on the condition that if she fails to obtain true love’s kiss within three days her soul will belong to Ursula forever. She is not a victim of circumstances but of her own lust and impatience. You could argue that Simba and Elsa didn’t know the consequences of their actions when they fled their responsibilities. 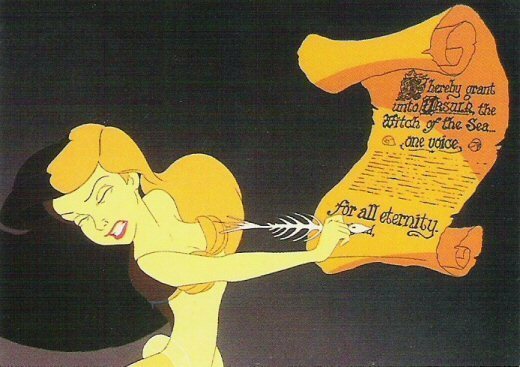 But Ariel signs Ursula’s contract, which lays out the terms and conditions. She has the benefit of wise council, urging her not to sign. And yet she signs anyway. Ariel’s fall is no accident. She is not a victim of circumstances but of her own lust and impatience. It’s rare for Disney to portray its heroes in such unflattering terms. And so we come to probably the creepiest aspect of this film: the “unfortunate souls”. These are the remnants of the people trapped by Ursula’s contract in a withered, half-annihilated state of servitude for eternity. This is just about the wrongest thing I’ve seen in a children’s film since I watched a Skeksis drain the life force from a Gelfling in The Dark Crystal. In other Disney animated films, we’ve seen people turned to stone, trapped in sleep, transformed into other creatures, and oppressed by cruel dictators. But all of these conditions see the prisoners kept either in unthinking and unfeeling stasis or in full possession of their mental faculties though in constrained circumstances. A much worse fate awaits Ursula’s victims in The Little Mermaid. 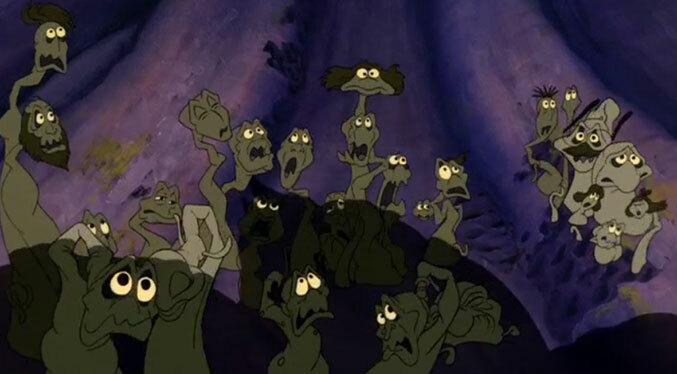 These people are not put to sleep, but they have their bodies torn and mutated into a squishy husk; their minds are apparently alive but they cannot speak; they must yearn for freedom but they are trapped to the floor of Ursula’s cave to be walked over by all who pass through; they want to be recognised and saved but even Ariel dismisses them as she enters, probably thinking they’re just fronds of seaweed. For all intents and purposes, Ursula’s unfortunate souls are basically in hell. Faust is bored and depressed with his life as a scholar. After an attempt to take his own life, he calls on the Devil for further knowledge and magic powers with which to indulge all the pleasure and knowledge of the world. In response, the Devil’s representative, Mephistopheles, appears. He makes a bargain with Faust: Mephistopheles will serve Faust with his magic powers for a set number of years, but at the end of the term, the Devil will claim Faust’s soul, and Faust will be eternally damned. The term usually stipulated in the early tales is 24 years; one year for each of the hours in a day. During the term of the bargain, Faust makes use of Mephistopheles in various ways. In many versions of the story, particularly Goethe’s drama, Mephistopheles helps Faust seduce a beautiful and innocent girl, usually named Gretchen, whose life is ultimately destroyed. However, Gretchen’s innocence saves her in the end, and she enters Heaven. In Goethe’s rendition, Faust is saved by God’s grace via his constant striving—in combination with Gretchen’s pleadings with God in the form of the Eternal Feminine. However, in the early tales, Faust is irrevocably corrupted and believes his sins cannot be forgiven; when the term ends, the Devil carries him off to Hell. Faust dressed up for children? If this isn’t the darkest Disney animated film, I don’t know what is. Finally, let’s look at how the film’s villain, Ursula, is dispatched at the end. Disney films typically end with the villain perishing as a result of their own villainy – their own essential and irrevocable corruption drives them to their deaths. Gaston falls when he refuses the Beast’s offer of help; Scar falls when he refuses Simba’s offer of help; Frollo falls when he refuses Quasimodo’s offer of help… OK, we’re seeing a pattern here. Practically never does the villain die because of a deliberate attack from our hero. But in The Little Mermaid, Ariel’s love interest Eric impales Ursula through the heart with the bow of a ship. How could we forget the film’s show-stopping musical number, the Oscar-winning calypso song Under The Sea, sung by Sebastian the crab? It’s a catchy, upbeat song, in the manner of Disney’s best loved songs. But like many of the best, it doesn’t represent the best attitude. I’ve already written about how Frozen’s Let It Go is an ode to selfishness. The Lion King’s Hakuna Matata celebrates a care-free existence (at everyone else’s expense). The Jungle Book’s The Bare Necessities recommends a life of fecklessness, depending on everyone else to meet your needs. The only thing we know Triton stands for is segregation from the humans on the surface. Despite his caribbean accent, he sounds like a rich, white plantation owner demanding Ariel stay at home instead of running off to marry a black man. And Disney had children singing this stuff back in the early ’90s. In adapting this animated film from Hans Christian Andersen’s sad and beautiful fairy tale, writers/directors John Musker and Ron Clements came up with a bright and perky movie.